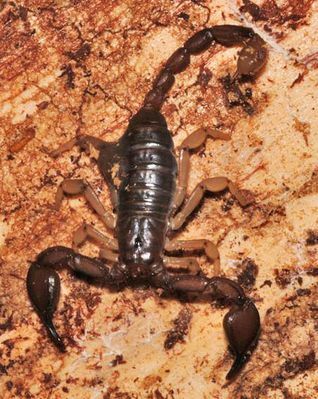 Scorpiones – Wiki der Arachnologischen Gesellschaft e. V.
Die Skorpione (Scorpiones) formen die älteste, primitivste rezente Ordnung der Spinnentiere (Arachnida) mit 13 beschriebenen Familien und etwa 1400 Arten weltweit (Parker S. P. 1982). Körperlänge: 10 bis 180 mm. Das Prosoma ist sechsgliedrig. Der ganze Carapax liegt auf der dorsalen Seite. Ein Paar von submedialen Augen und bis zu 5 Paare von Seitenaugen sind vorhanden. Die dreigliedrigen Cheliceren sind scherenartig. Die Pedipalpen sind die Scheren der Skorpione und bestehen aus 6 Gliedern. Die Coxen der ersten und zweiten Laufbeinpaare tragen anteriore Aufsprünge und formen die Basis der Mundhöhlung. Dadurch unterscheiden sie sich von anderen Spinnentieren, bei denen die Mundhöhlung durch die Enditen der ersten Coxen gebildet ist. Das Opisthosoma weist 13 Segmente auf. Die letzten 5 Segmente sind zu schmalen Ringen verengt und bilden das Metasoma. Dieses trägt das Telson (Endstachel und Giftblase) (Parker S. P. 1982). Buthidae ? ? ? ? ? ? ? ? ? ? ? ? ? ? ? ? Euscorpiidae ? ? ? ? × ? ? ? ? ? ? ? ? ? ? × × × ? × × ? Iuridae ? ? ? ? ? ? ? ? ? ? ? ? ? ? ? ? Troglotayosicidae ? ? ? ? ? ? ? ? ? ? ? ? ? ? ? ? Buthidae × × ? × ? ? × ? ? × ? ? ? × × ? × × × × × ? Euscorpiidae ? × × × × × × × × × × × ? × ? × × × × × × ? Iuridae ? ? ? ? ? ? ? ? ? ? ? ? ? ? ? ? ? × ? ? × ? Troglotayosicidae ? × ? × ? ? ? ? ? ? ? ? ? ? ? ? ? ? ? ? ? ? Ythier, E.: Scorpions of Europe (in The Scorpion Fauna). Rein, J. O.: A review of the scorpion fauna of Europe (in the Scorpion Files). Mahsberg, D., R. Lippe & S. Kallas (1999): Skorpione. Natur und Tier-Verlag. 1 Auflage. ISBN 3931587150. Administrator (2009): Infoseite zu Mesobuthus gibbosus. www.skorpionforen.eu, 1 S.
Fet V., M. E. Soleglad, A. Parmakelis, P. Kotsakiozi, I. Stathi (2014): Two new species of Euscorpius from Euboea Island, Greece (Scorpiones: Euscorpiidae). Arthropoda Selecta 23, S. 111–126. Fet V., M. R. Graham, M. M. Webber & G. Blagoev (2014): Two new species of Euscorpius (Scorpiones: Euscorpiidae) from Bulgaria, Serbia, and Greece. Zootaxa 3894 (1), S. 83–105, ISSN 1175-5334. Graham M. R., M. M. Webber, G. Blagoev, N. Ivanova & V. Fet (2012): Molecular and morphological evidence supports the elevation of Euscorpius germanus croaticus Di Caporiacco, 1950 (Scorpiones: Euscorpiidae) to E. croaticus stat. nov., a rare species from Croatia. Revista Ibérica de Aracnología 21, S. 41–50, ISSN 1576-9518. Kovařík F., V. Fet, M. E. Soleglad (2014): Euscorpius yagmuri sp. n., a New Scorpion Species from Epirus, Northwestern Greece (Scorpiones: Euscorpiidae). Euscorpius 193, S. 1–11. Lourenço W. R. & A. Rossi (2013): Confirmation of a new species of Buthus Leach, 1815 from Sicily (Scorpiones, Buthidae). Biogeographical Implications. Revista Ibérica de Aracnología 22, S. 9–14, ISSN 1576-9518. Lourenço W. R. (2015): The genus Belisarius Simon, 1879 (Scorpiones: Troglotayosicidae), with the description of a new vicariant species from the south of Spain. Comptes Rendus Biologies 338 (5), S. 362–367. Rossi A. (2012): Notes on the distribution of the species of the genus Buthus (Leach, 1815) (Scorpiones, Buthidae) in Europe, with a description of a new species from Spain. Arachnology 15 (8), S. 273–279, doi:10.13156/arac.2012.15.1.273. Tropea G. & V. Fet (2015): Two new Euscorpius species from central-western Greece (Scorpiones: Euscorpiidae). Euscorpius 199, S. 1–16. Tropea G., A. Parmakelis, N. Sziszkosz, K. Balanika, A. Bouderka (2014): A new species of Euscorpius Thorell, 1876 from Naples Province, Italy (Scorpiones: Euscorpiidae). Euscorpius 182, S. 3–10. Tropea G., E. A. Yağmur & V. Fet (2015): A Revision of the Anatolian-Caucasian "Euscorpius mingrelicus Complex" (Scorpiones: Euscorpiidae). Euscorpius 203, S. 1–32. Tropea G., V. Fet, A. Parmakelis, P. Kotsakiozi & I. Stathi (2015): A new species of Euscorpius from Bulgaria and Greece (Scorpiones: Euscorpiidae). Euscorpius 207, S. 1–15. Tropea G., V. Fet, A. Parmakelis, P. Kotsakiozi & I. Stathi (2015): A new species of Euscorpius (Scorpiones: Euscorpiidae) from southern Bulgaria. Arachnologische Mitteilungen 49, S. 10–20, doi:10.5431/aramit4902. Tropea G., V. Fet, A. Parmakelis, P. Kotsakiozi & I. Stathi (2017): Redescription of Euscorpius tauricus (C.L. Koch, 1837), with the description of two new related species from Greece (Scorpiones: Euscorpiidae). Ecologica Montegrina 7, S. 614–638, ISSN 2336-9744. Tropea G., V. Fet, A. Parmakelis, P. Kotsakiozi, I. Stathi (2014): Three new species of Euscorpius (Scorpiones: Euscorpiidae) from Greece. Euscorpius 190, S. 1–22. Tropea G. (2012): A new species of Euscorpius Thorell, 1876 (Scorpiones, Euscorpiidae) from Italy. Bulletin of the British Arachnological Society 15 (8), S. 253–259. Tropea G. (2013): Reconsideration of the taxonomy of Euscorpius tergestinus (Scorpiones: Euscorpiidae). Euscorpius 162, S. 1–23. Tropea G. (2013): A new species of Euscorpius Thorell, 1876 from the Western Balkans (Scorpiones: Euscorpiidae). Euscorpius 174, S. 1–10. Tropea G. (2015): A new species of Euscorpius Thorell, 1876 from Bosnia-Herzegovina and Croatia (Scorpiones: Euscorpiidae). Arachnida - Rivista Aracnologica Italiana 1 (5), S. 30–41. Tropea G. (2016): A new species of Euscorpius Thorell, 1876 from Sicily, in southern Italy (Scorpiones, Euscorpiidae). Arachnida - Rivista Aracnologica Italiana 7 (2), S. 37–47. Yağmur E. A., H. Koç & W. R. Lourenço (2011): A new species of Buthus Leach, 1815 from Cyprus (Scorpiones, Buthidae). ZooKeys 115, S. 27–38, doi:10.3897/zookeys.115.1135.